The politician behind new laws says the FIFA scandal has severely damaged Switzerland's reputation and people have had enough. 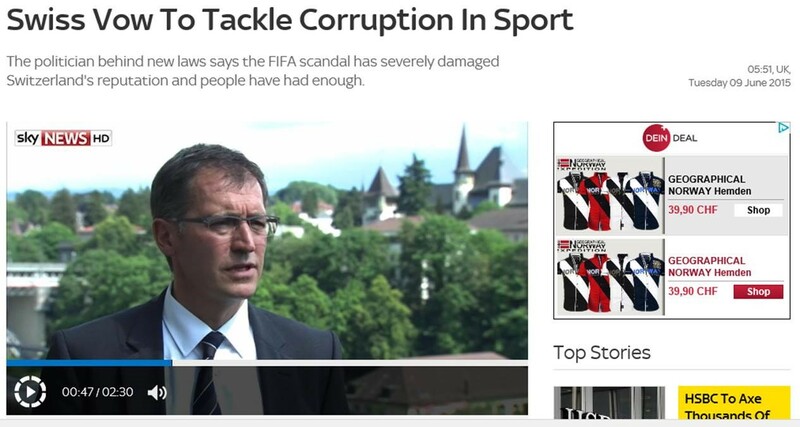 Swiss lawmakers say they will bring in stringent new legislation aimed at cracking down on corruption in sport in the wake of the FIFA allegations. A vote has already been passed in the parliament in Bern which will see far greater scrutiny of financial transactions made by sporting organisations. New laws will also give the authorities the right to scrutinise the bank accounts of sporting bosses, their employees and even their family members. More than 60 sporting federations - including FIFA and the International Olympic Committee (IOC) - are based in Switzerland and they all benefit from tax-exempt status. But numerous scandals and corruption allegations have prompted Swiss lawmakers to finally act. The politician driving the reforms through parliament here is Roland Büchel, who once spent three years working in sports marketing alongside FIFA president Sepp Blatter. "People here are saying 'enough is enough'," he said. "Our reputation as a country has definitely been damaged. You can see the reaction from the outside world. "It's an incredibly big step to make private corruption a criminal offence. Maybe we have been too slow, but now we are doing it." He added: "The message is clear - if this happens again we will be very tough on you. People want things to change." Further legislation is planned to make corruption in sport a criminal offence. It could mean that wrongdoing anywhere in the world by a sports official could result in a prosecution in Switzerland, if the relevant governing body is based there.